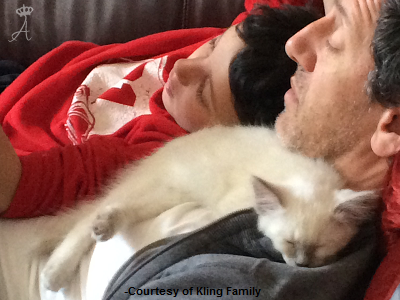 Thank you for your interest in one of our kittens! 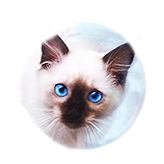 Here you will find client references, and testimonials of past Azureys Balinese Kittens that are all around the country, if not world. We are first time cat owners and couldn't have asked for a more helpful and patient person to walk us through everything than Edison. He was extremely helpful when trying to navigate the export process to Hong Kong and helping us figure out the vaccinations and paperwork. Edison kept us updated with videos and photos of Jasper throughout the five months. He made numerous phone calls for us and visits to the vet to ensure everything was in order. Jasper has settled in nicely and is the perfect addition to our family. He's extremely smart, very curious and has lots of energy. He loves to play fetch with his mouse or trying to bat the cork on a string. Jasper is a talkative little fellow and greets us each morning and then flops down for a belly rub. He's very curious and loves being right there in the action seeing what we're up to. He's also strikingly handsome and has the most beautiful blue eyes and colouring. Each day he grows more and more a part of the family and keeps us entertained. 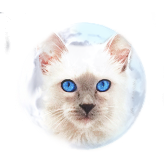 It was a pleasure working with Edison during every step of the process and I'd highly recommend him and his line of Balinese cats. Thank you! Working with Edison and Azureys Cats was a wonderful experience from the beginning. Edison was very professional and answered all my questions from our first phone call to all the many follow-up emails after that. I was kept informed of all the litters and notified when "my" kitten was finally born. 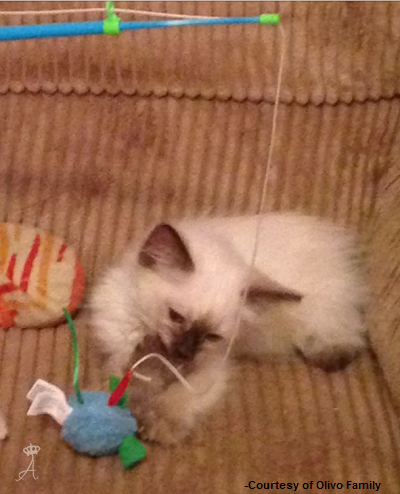 I have been absolutely thrilled with my kitten, Picco (short for Piccolo Zaffiro or Little Sapphire in Italian). He is so much more than I had expected, He is full of life and playful but also has the sweetest disposition and loves to just snuggle and purr. He is a bit shy when meeting new people but quickly warms up and wants to play with them too. He greets me when I come home and plays fetch like a dog. He used his litter box from day one and hasn't had any issues in that area. He is growing so fast and changing from an adorable kitten to a beautiful, handsome, sweet cat. I love him so much and am so happy with him and all my dealings with Azureys Cats and Edison. Thank you so much Edison for such a wonderful little guy. I can't imagine my life without my Picco. 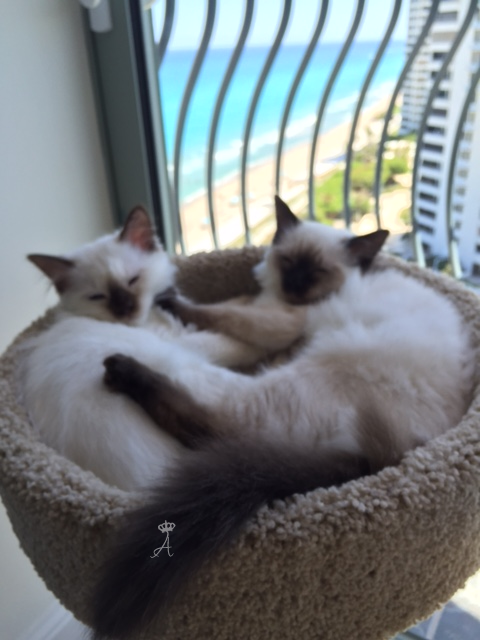 We purchased Tam (a blue point male) and Lily ( a seal Lynx point) from Azureys Cats in May of 2015. 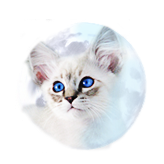 They are the most wonderful cats, beautiful, very smart, and with the sweetest temperament to match. From the beginning when we contacted Edison to the end of the process when we brought them home, Edison made the entire process very easy and smooth. We loved that we got weekly/monthly newsletter updates and videos of the kittens up until the point when we were able to come and meet them and select which ones would be ours. Edison was extremely responsive and knowledgable. Even months later he still is there to answer any questions we may have. 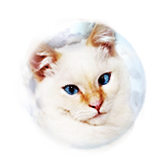 I would definitely recommend Azureys cats to anyone interested in the breed. 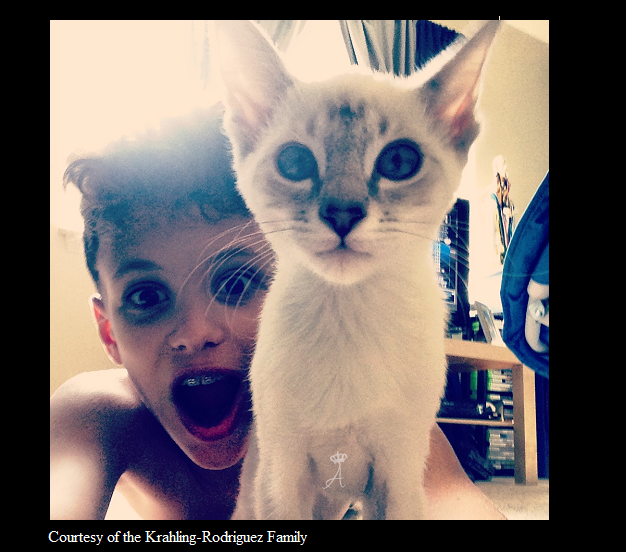 Krahling- Rodgriguez Family from Parlin, NJ. 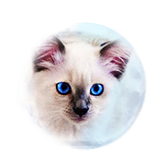 We started our research on the listings of cat breeds that claim to have a hyperallergenic quality. My 10 year old is highly, highly allergic to most animal dander. The Balinese breed was the most beautiful to our family. Azureys cats was located in our area, and without any hesitation, Edison invited us over immediately to meet with his cats to see if my son would have a negative reaction. We visited for about an hour or more. We watched my son closely on the ride home, and he was fine. No reaction. Just to be certain, we visited again once our litter was born, and again no reaction. We did have one hick-up with being bumped from an earlier litter, due to a family before us wanting a kitten sooner, but I do believe that Edison handled it the best he could at the time. But it was still hard for my son to accept that we would have to wait longer to bring home our new addition. We are now very proud cat owners with absolutely no regrets what so ever. He is the sweetest, friendliest kitty. He doesn't hide when we have guests. He greets them all. He follows us around wherever we go. 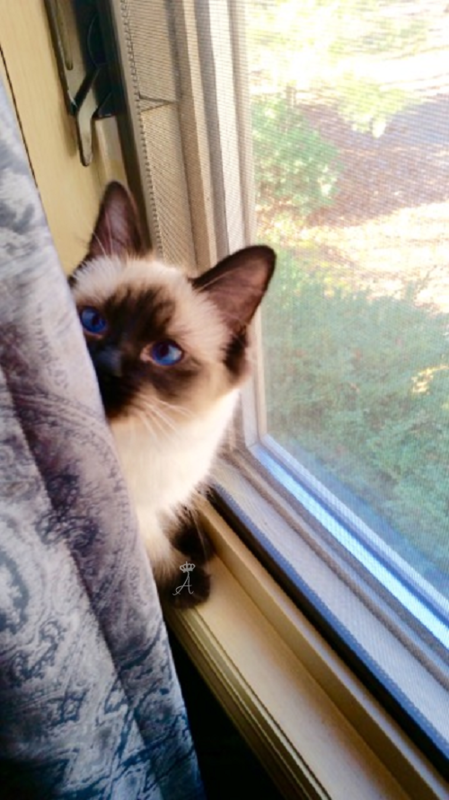 He loves to play hide and seek. He plays under the covers on our bed. He's always very vocal in the mornings, when we get home. Never owning a cat before, Edison has always been available for questions and concerns we might have. I trust our vet with our concerns, but will always entrust Edison and his advice. Tourville Family from Flemington, NJ. Hi Edison - I wanted to let you know that Rosie and Sophie made the trip to FL just fine. They were very good travel mates and really loved having 10 days of our attention without distraction. They loved being in our condo so hopefully they will make future trips with us. They are really such a joy to have in our lives! Everyone that meets them really adores them. Here are a few photos of them from FL. We are enjoying their very different personalities and watching them play and grow. I hope all is well with you. I am sure you are busy with your current litter and know you will be making many families happy in the future. Courtesy of the Tourville Family while vacationing in Florida. Taylor Family in Tabernacle, NJ. I have to start out by saying that your cats are amazing. They are smarter than any cat I have ever had and absolutely gorgeous! The people at our vet teased me they wouldnt give her back after her spaying because they absolutely fell in love with her beauty and personality. 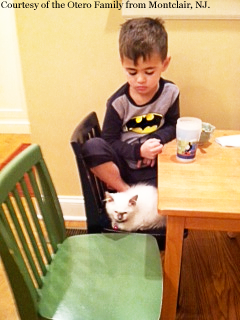 I'm very pleased that the two people in my household that have cat allergies have no issues with her. I was very fortunate to find your breeding program and that you are so close to home. You have a wonderful program with high quality cats. Gracie blesses us with many laughs in addition to her kisses and loving nature. From leaving her toys in our shoes to playing fetch and to playing chase like a puppy. There isn't a day that goes by that we don't think how happy she makes us. We can't picture our family without her. She makes everyone smile when she walks in the room and we each secretly hope that she chooses themself to project her affections on. We thank you, Edison, for breeding such wonderful additions to people's homes. They are not just pets but an extention of a family. I know that if/when the time comes for another addition you will be the one we go to again. I have included some pictures between her first week with us and today. She has grown so fast! Her seal point color is really coming out and adding to her beauty. Thank you! For the amazing little furry family member we call Gracie! 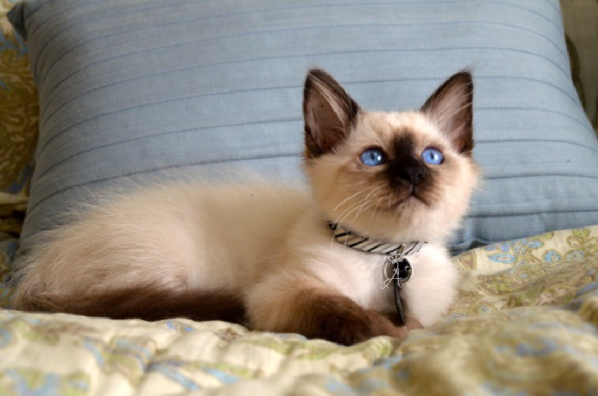 We highly recommend you to anyone interested in the Balinese cat breed! Zedalis Family in Milltown, NJ. 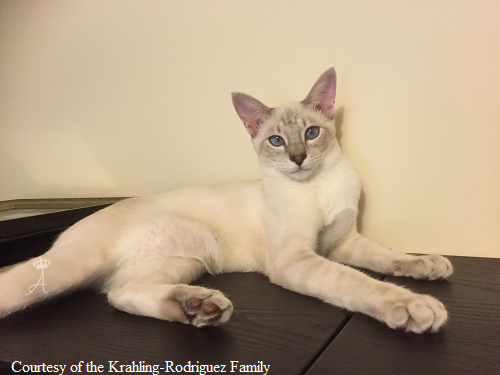 When beginning to look for a new kitten to bring into our family, my fiance Keven and I wanted to make sure we brought in a breed that would not only get along with us but also get along with our current cat, Edgar. When looking into many different breeds, we stumbled upon the balinese breed and immediately fell in love. From here, we were lucky to find such a wonderful breeder. 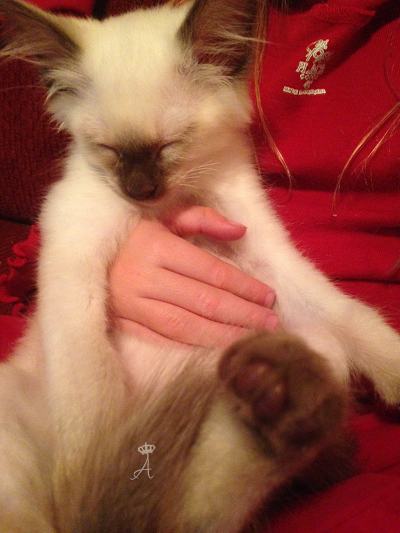 Since our first call with Edison, he filled our ears on all the information one could possibly need to learn about the balinese cat and the adoption process. 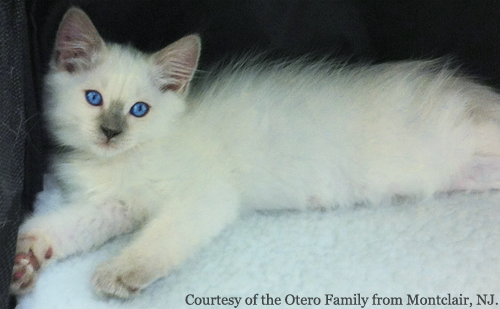 Each week we were able to get an updated video and email of the kitten we chose to see how he was growing. At 8 weeks, we were able to come see our kitten, whom we have now named Jånos. Finally at 12 weeks, we were able to bring him into our home and introduce him to Edgar. I have to admit, I was nervous to see how Edgar would feel about Jånos but after 3 days, both were welcoming, running around and playing around with one another. They are quickly growing to be close friends. When taking Jånos to the vet for our initial visit, he was in perfect health and has been ever since. He has truley been such a joy to have in our home and we can not thank Edison enough and would recommend him to any of our friends and family. Faidely Family in Englewood Cliffs, NJ. When my family decided to finally adopt a cat, I researched different breeds and breeders for almost a year. I considered any breeder, even as far away as across the country. About half way through my frustrating search, I came across Azureys Cats and these absolutely amazing Balinese kittens. Edison was absolutely professional and completely responsive during our entire (long) communication. The day was chose our kitten was magical. Clementine seemed to go straight to my daughter and they had an instant bond. Edison has been wonderful with my 100-questions/day for the last month. He has walked us through every step of the process and made it so much easier and more comfortable. Clementine has been home for over a week now, and I can say that she has surpassed all of our expectations. She eats very well, uses her litter box perfectly, and is the perfect mix of snuggly and affectionate and playful and feisty. She purrs nonstop and follows us around! She licks our hands affectionately and loves to be rubbed and petted. When it is playtime, she is very athletic and fast! She leaps and bounds all over the place. She is very good natured and even lets my 5- year old play with her for nonstop hours. She is smart and curious and responds to our conversations with her already! She is already a part of the family and we absolutely love her. She has been beautifully trained and is very well socialized. The vet was impressed with her shots, organized records, microchipping, etc. 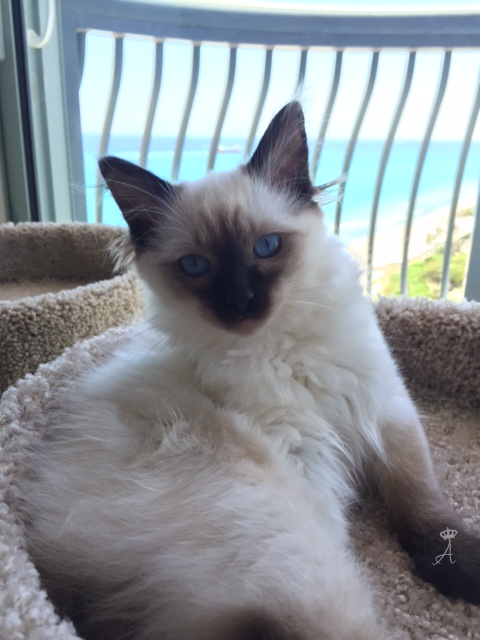 We are all so pleased, and highly recommend Azureys cats to anyone seeking a smart, fun, lovable, healthy, beautiful kitten! Our Clementine is just perfect. Update: Elizabeth is a very talented violinist, she played for us and our cats. Incredible! 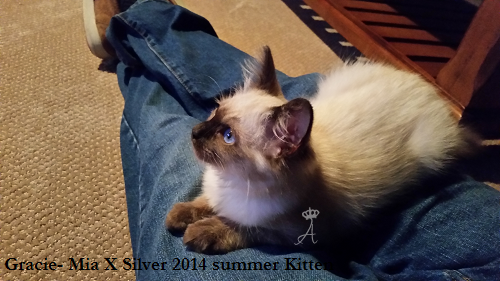 Clementine, a Princess X Silver kitten. Nely and Family in Teaneck, NJ. I am so sorry I didn't write sooner--I planned on sitting down and updating you (appropriately at Thanksgiving)--but time just got away from me! Emmy is fantastic!!! The old geezers are doing well too, and everyone gets along fabulously! 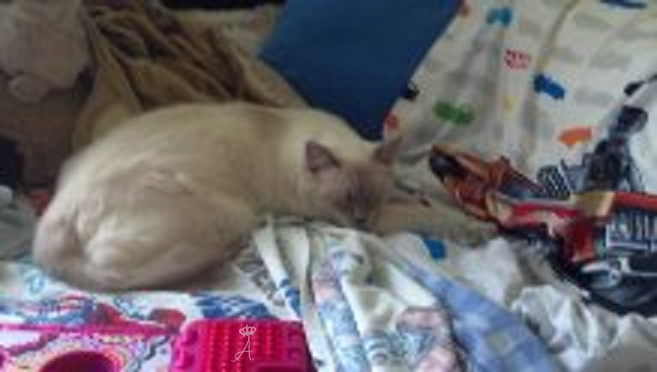 My old siamese boy loves to groom the baby (sometimes just to distract her from biting his tail--which,in Emmy's defense, does look like an awesome toy, always moving, heck I can hardly resist ;). She also bonded really well my old Balinese guy, it's almost as though they both recognized that they came from the same tribe. The old lady benignly ignores her for the most part, but will let her sleep in her favorite spot, and ear from her bowl, and if that's not acceptance , I don't know what is! She is fascinated by water! While she doesn't jump into the water she does love to see it run. Loves sitting in the tub and sink and supervises all water related activities. I've bought a second fountain because she actually encouraged my others to drink running water, before her arrival the kitty fountain was mostly decorative. I'm amazed at how bright she is! She's learned to open the drawers of both my desk and my vanity (treats in the desk, toys in the vanity) by putting her paw through the drawer pulls and sort of hooking and pulling at the same time--I've never seen a cat do that! She loves to play fetch with mylar balls, and will touch her nose to my lips when I tell her to "give momma a kiss". A day doesn't go by when she doesn't make me laugh at least one time. And of course, in between her energetic play and exploration, she has her moments of extreme sweetness, punctuated by a purr that seems to belong to a kitty twice her size. So in short, we are doing great! Please feel free to use me as a reference for anyone interested in one of your kittens--when I am ready for another youngster, you will be the only person I would consider. Also, feel free to share my contact info with any perspective adopters that may have questions or concerns. I consider myself a very experienced owner, and would not hesitate to sing your praises to anyone! 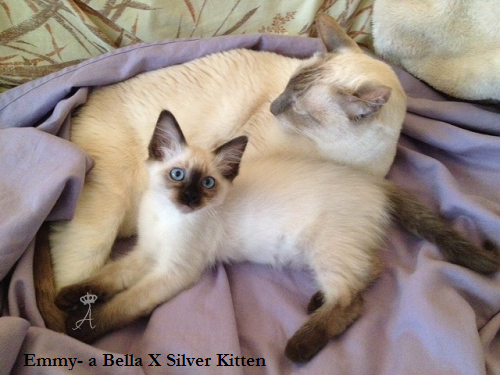 Emmy, a Bella X Silver kitten. Slabaugh Family from Madison, NJ. 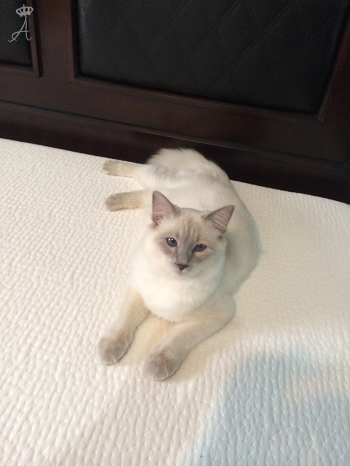 We couldn't be happier with our beautiful Azureys Balinese cat, Sophie. 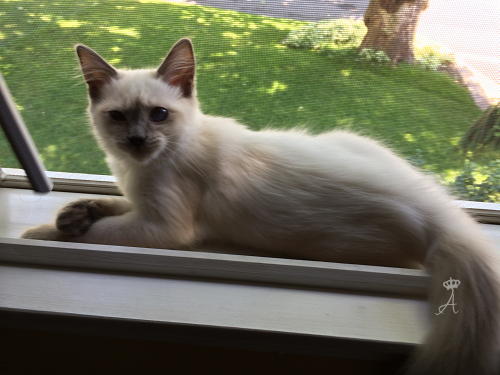 We struggled to find a breed that would not trigger my son's cat allergies and we were so excited to discover the Balinese cat breed. Not only are they beautiful, with amazing personalities, but they also have allowed us to finally have the joy of a pet in our home. It's been more than a month and not a single reaction. And of course her favorite place to sleep is on his bed. We feel so lucky to have been given the opportunity to welcome Sophie into our home and even more blessed to have found Azureys, who were just amazing throughout the process. Ng Family from Waldwick, NJ. This was our first experience working with a breeder. Azurey's Cats and Edison have been an absolute pleasure to deal with. Extremely knowledgeable and helpful every step of the way; all the way from determining if this breed was right for us, up to picking up our new family member. 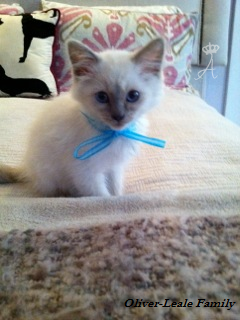 Answered all of our questions and kept us completely informed on the progress of our kitten, Luna. <[>Highly recommended with no worries. Leale Family from Montclair, NJ. Our family could not be happier to have Oliver in our home. 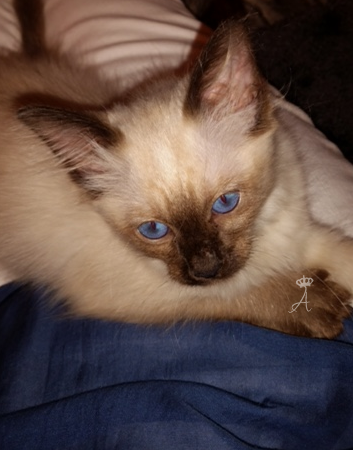 Besides being a beautiful Balinese kitten, he is sweet, loving, funny, and a perfect family pet. He loves to be held and sits on one of us at all times. So sweet!…...You did such a great job socializing and training him in the early months of his life. He went right to the litter box. The vet was even impressed on what a thorough job you did with his shots and any care in those first few months. You were very good from start to finish answering all of the questions I had. I had a lot of questions, but you answered them patiently and I was able to get this perfect little kitten who is now a part of our family. We will have to talk about getting him a brother or sister. You did an awesome job……………..thank you!! Jackie & Ronaldo from Quincy, MA. 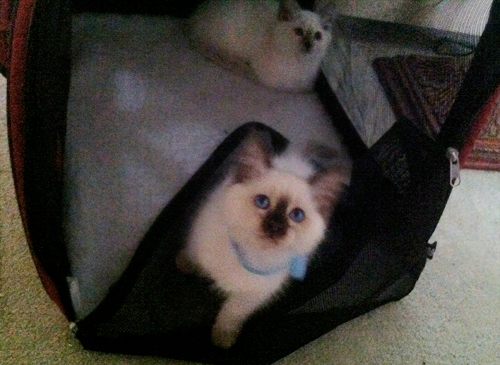 Edison, Attached is a photo of our Balinese kittens- Looch (from one of your litters) and our other Balinese kitten Hazel. We couldn’t be happier with them! We spent a lot of time visiting animal shelters and getting sick with cat allergies before learning of the Balinese cat breed. Thank you for being so informative and letting us visit your home before we decided to get our Balinese kittens. As much as we would have loved to adopt from a shelter, this was finally our way of having the cats we have always wanted and not be taken over by sneezing, rashes and being run down. We haven’t been bothered by their fur or by any licking. Looch will wake us up by rubbing against our face and it doesn’t bother us at all! 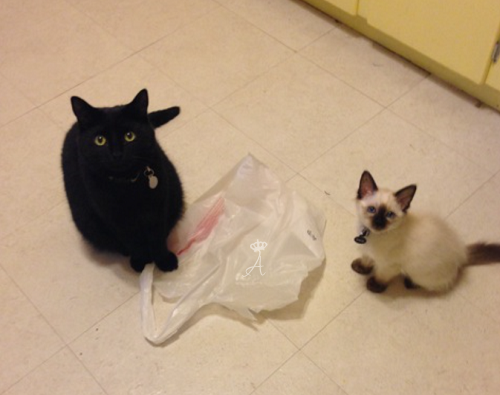 Both kittens we have are friendly, playful and incredibly lovable. 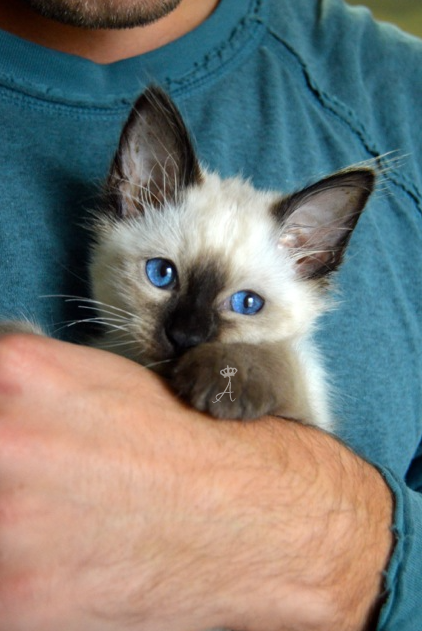 We love them both and the Balinese cat breed. 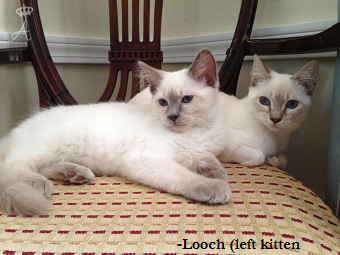 Thank you for providing Looch as the addition to our family! Best of luck with your cattery. Olivo Family from Roselle Park, NJ. I wanted to let you know that Jasmine is perfect. My boys love her as do I. The experience from start to finish was amazing, you kept me updated with pictures and video and also answered any and all questions I had. Jasmine is the queen of the house, she loves to play and if you stop she is quick to tell you she is not done, she talks a lot. I am so lucky to have her. I want to thank you again for my beautiful baby, I'm thinking maybe next year I will get her a sister. I will stay in touch. Hello Edison, I want you to know that Luna is a wonderful kitten - better than I had I imagined. She is extremely sweet, friendly, cuddly and playful. She hid for only one hour and has been out and about playing or lying on someone's lap or chest. We are all happy and falling in love - all five of us :-). 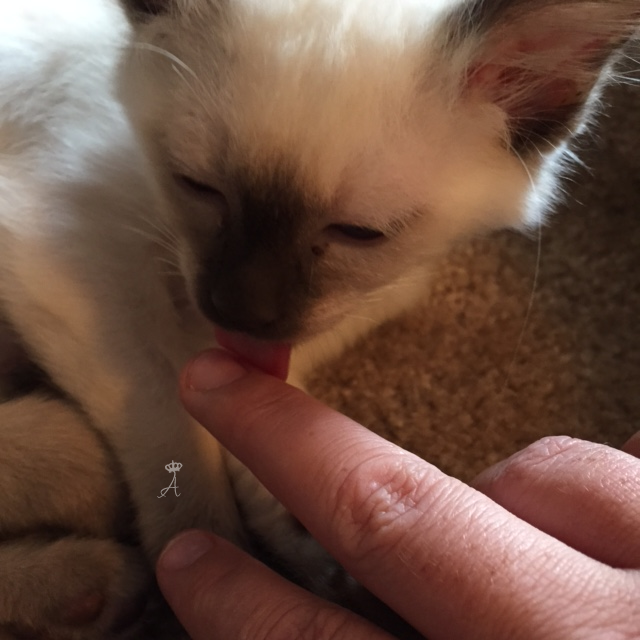 It is clear to me that both the traits of the Balinese breed and your wonderful care of the kittens from birth have created this outstanding little kitten, who is bringing joy into our home already. Thank you so much for everything. 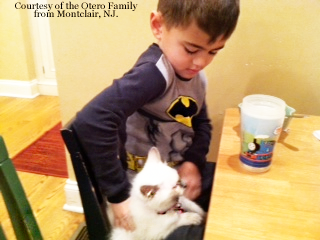 Otero Family from Upper Montclair, NJ. Winter is the sweetest, most adorable cat and seems to be adjusting nicely. He is playing with the kids and is very cuddly!!! They love him! He is eating, drinking, and just used his litter box for the first time. Thank you for taking such good care of him, and raising him to be so friendly and gentle. Winter, a Bella X Achilles kitten. - Otero Family from Montclair, NJ. Sorry for not getting back to you sooner. 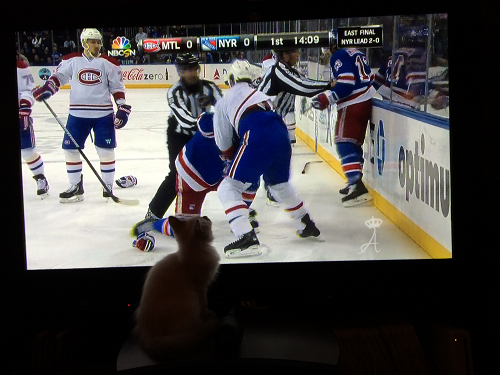 The kittens are great. I commend you and your family on training and socializing them. They are inseparable little clowns. It is a good thing that they were adopted together. They are also very loving lap cats that want to be with you all the time. They have very sweet personalities. They are eating well and enjoy playing with the water fountain drinking bowl. They also use the litter box and love their scratching posts. Hopefully, they will be cherished members of my family for many years to come. Once I get organized, I will send you some pictures. I have not made a vet appointment yet, but intend to do that this week. Thank you for inquiring about them. Your loving care of the kittens definitely shows. I wish you well in your breeding endeavors. - Mary from Morris Township, NJ. 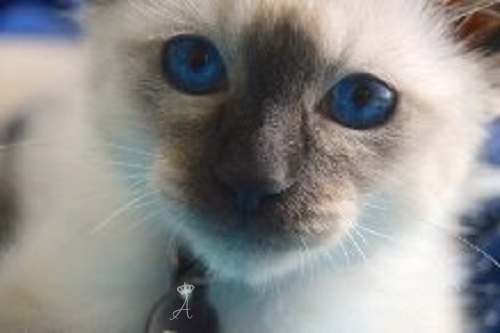 2/27 Meet Princess, a Balinese Lilac Point from Azureys. 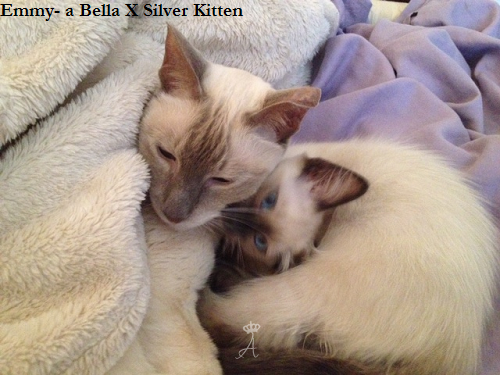 2/16 Two beautiful kittens available from Bella X Achilles.